After living in the United Arab Emirates for more than 7 years, I just discovered a new photography paradise... It all started by a blogpost of Michael Cruz, another UAE based photographer who posted a new HDR (High Dynamic Range) image on his website. "Deserted less than forty years ago, Jazirat Al Hamra is purportedly one of the only complete villages of its kind still standing in the Gulf Region, which gives a glimpse of what life was like before the discovery of oil. Situated only a short distance off the main highway running between Ras Al Khaimah city and the Al Hamra development and a couple kilometers from the Al Hamra Mall, the village is not readily spotted from the road. But once pointed in the right direction, one quickly arrives at its outer edge, where an old fort and tower watch in eerie silence over empty streets and abandoned buildings, some at least a century old. Mosques, shops, and houses – with courtyards overrun by vegetation and quaint features like star windows, wind-towers, and carved doors – all lie in varying states of decay and disrepair. Beyond the tower, the main village paths meander through the town towards the sea and eventually converge in a town square of sorts, where the souk – a handful of stores and open-front shop buildings – was located. Some of the most interesting buildings in the town can be found here, including a small mosque, complete with a tiny, crudely-shaped minaret tower and a large house with wind-catchers, where a well-to-do merchant lived. Once home to a thriving pearling and fishing community, the town’s proximity and relationship to the sea is evident everywhere, on the sandy pathways with shells and coral strewn all about, as well as the very buildings themselves, which were made from coral and bricks of sand and shell. Traditionally, pearling was a major source of income for Ras Al Khaimah’s coastal towns, and Jazirat al Hamra’s location, believed to have been inhabited since at least the 16th century, was abandoned only in the latter half of the 20th century, after the decline of the pearl trade. 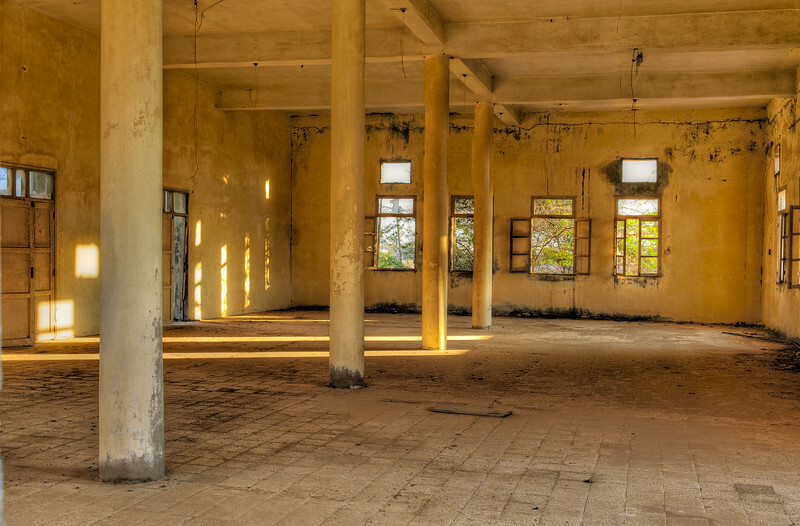 Former residents still living in the area can be found gathering in the souk area with old friends and companions and are often happy to point out their former homes, reminisce, and share fond memories of the place they once called home as well as their fears for its future. Not an official tourist site, the town occupies an enviable portion of waterfront property and is threatened by the modern developments encroaching on it from all sides. 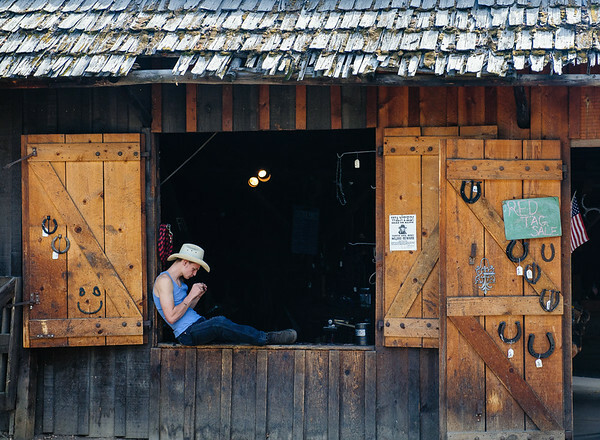 For this reason, many of the families who still own property in the town are reluctant to sell, and some wish that the town’s value as an important historical / heritage site would be officially recognised, before it disappears forever. 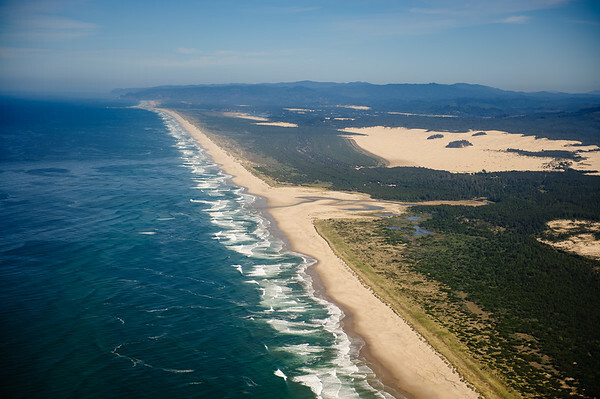 Most of the major paths in the village are wide enough to be navigated by automobile, and four wheel drive vehicles are recommended, as portions of the area are covered with soft sand. 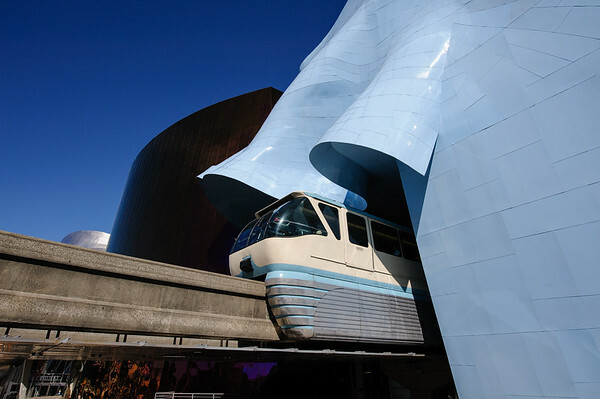 The site is quite large, with diverse types of architecture from different decades, and photography and history buffs alike could easily find themselves taking several hours to explore it all. But those visiting close to sunset are warned to beware – It is said that the Djinn, who dwell there now, emerge at night fall"
Kjell's orginal article can be found on page 11 of the electronic version of the Free Spirit RAKTZ magazine. Shortly before sunset I bumped into another Dubai photographer by the name of Jason Kotecha who has some great work at Escapism. Jason also discovered Jazirat Al Hamra through the powers of social media. Exactly like myself. I'm sure that Michael, Jason and myself will try visiting this place again and even better will try to shoot together in the coming months. My second book, "Focus on the world below" is now available for purchase! The book (80pages) contains a collection of more than 100 Aerial Photography portfolio images shot all over the world and is printed by Blurb on high quality Premium paper. Focus on the World below makes for a perfect Christmas and/or New Years gift. 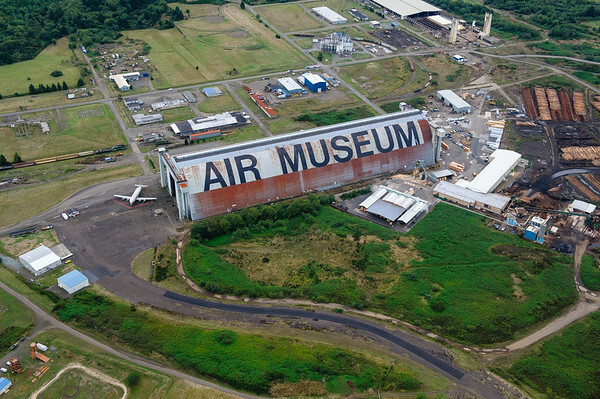 Today is the last day of our Chasing the Volcanos flying tour! 7 Days ago we left Livermore (CA) in our Cessna C172R, on a flying and photography adventure. Today we plan to get back to Livermore in the late afternoon. Time flies! The take-off at South Lake Tahoe airport (density altitude +8500ft) in our 160 horsepower Cessna, is not going to be a spectacular one. You pilots, will know what I'm talking about… Making things worse we're having a dilemma. Taking off with a 15 knots tailwind towards the lake or taking off, into the wind and accepting a rate of climb of about 200 to 300ft/min towards high ground. After seeing a fully loaded TB20 taking off downwind we go for the latter one. A spiraling climb to 9500feet over the lake brings us high enough to safely cross the surrounding mountains and we leave beautiful Lake Tahoe behind us. We need to get back to this place. Today's flying covers a large part of the camper tour we plan to do after this trip, in opposite direction. 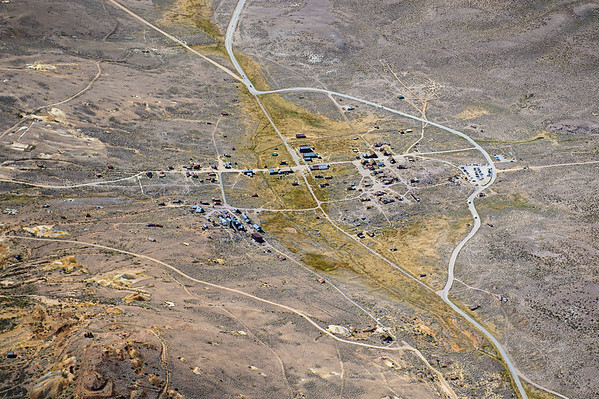 First interesting viewpoint is the Gold Mining town of Bodie. A very special place in a great location. More on this in our "Back to Nature" camper tour blogpost in the coming weeks. 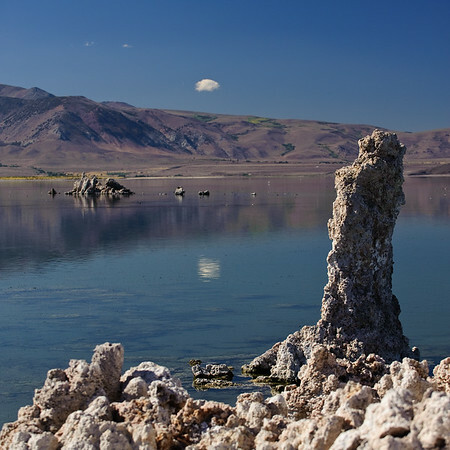 After passing Mono Lake we climb to an altitude of 12500ft… pretty much the maximum altitude we can get to in the current conditions. 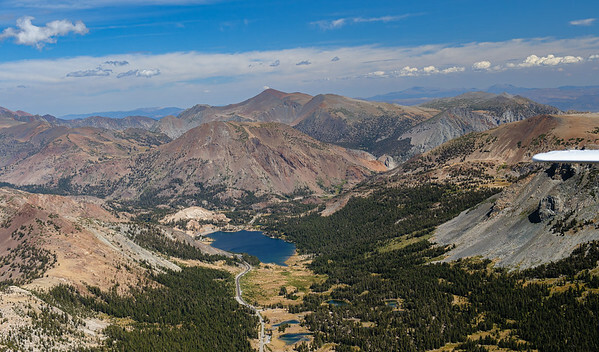 We need the higher altitude in order to pass the east entrance to the Yosemite national park, the 10000ft Tioga pass. Overflying Yosemite is limited to having a minimum of 2000ft terrain clearance but provides us with some great photo opportunities. 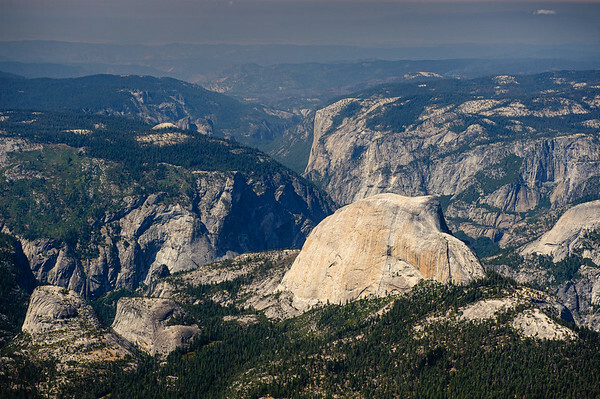 We can clearly make out El Capitan and Half Dome. 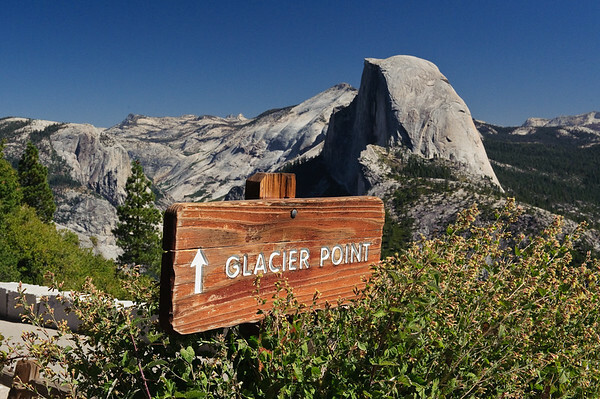 The latter being "The icon of Yosemite". Leaving Yosemite to the West we start our descend into Pine Mountain Lake, a very nice airpark which we visited earlier in 2001. 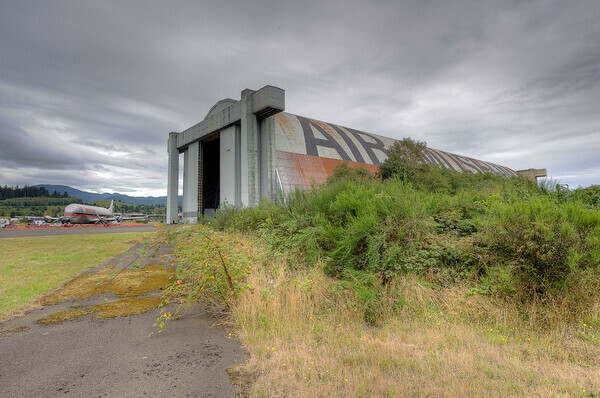 Airparks are places where people live on the airport and have a car and an aircraft parked in the hangar. Retirement paradise, if you ask me! After filling up with some cheap gas, we hop across to Columbia airport and walk over to Columbia State Historic park. 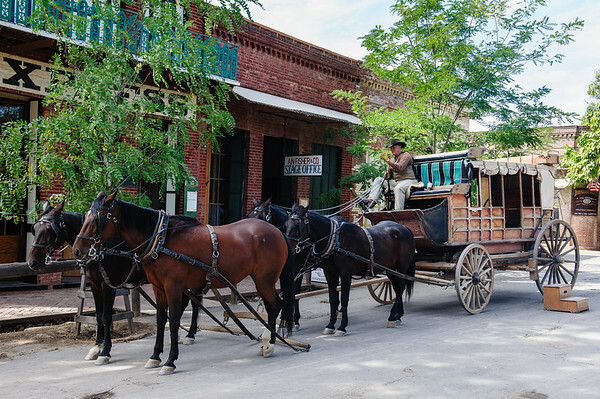 A very nice and well preserved Gold Rush boom town. 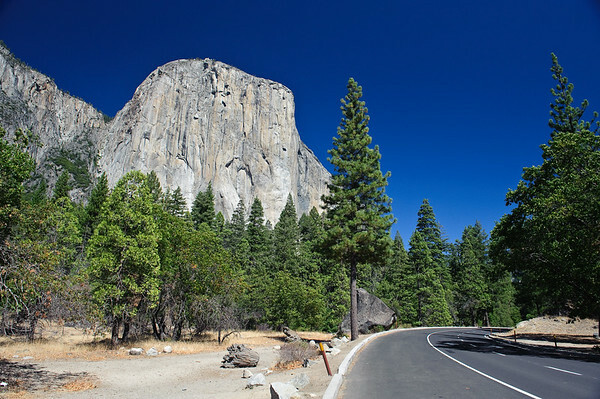 It is closed to all automobile traffic and is only open to pedestrians, horses and carriages. 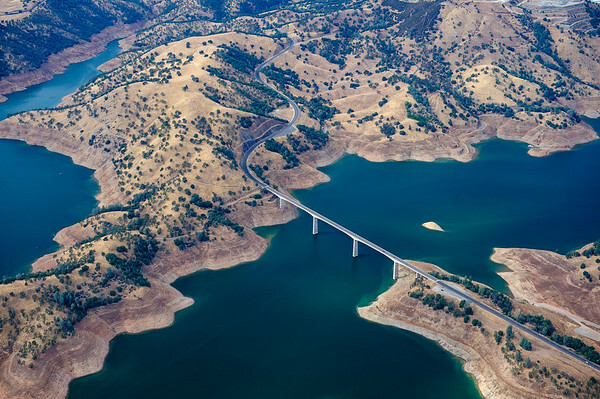 Just after our last take-off of the trip, we overfly the artificial New Melones Lake and have a nice view on some of the bridges. Less than an hour later we handover the keys of our faithful Cessna 172 to its owner at Livermore, CA. We finished our amazing weeklong "Chasing the Volcanos" tour with a total flying time of 23 hours over an estimated 3700km. 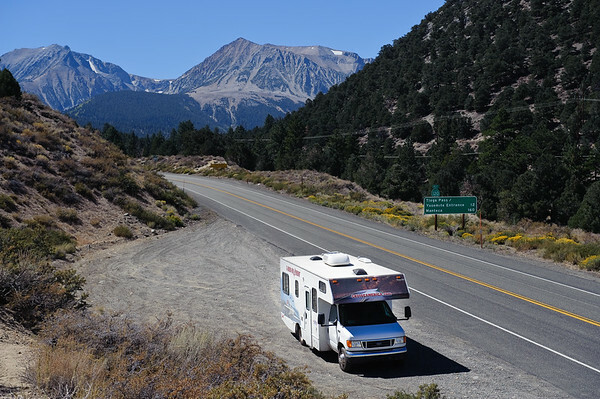 It brought us great views of the North West Pacific and the Sierra Nevada and will give us lifelong memories. I have a busy upcoming 10 days, so the next blog segment with the continuation of the trip and the "Back to Nature camper" tour only be online after the first week of November. 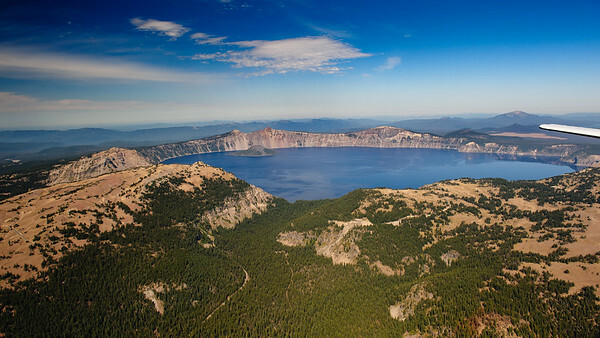 We climbed straight away to 9500ft (2895m) and headed for Crater Lake Oregon. With its 1948ft (594m), it is the deepest lake of the US and its crystal clear deep blue water would be the highlight of the day. Just before lunchtime we made a brief stop at Klamath Falls, an US Air Force F-15 Eagle base. 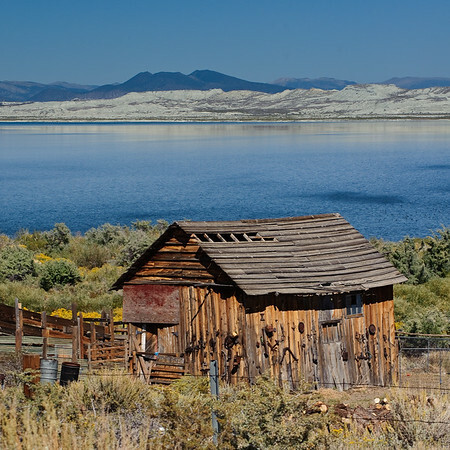 Just North of Klamath Falls is the 20 mile (32km) long Upper Klamath Lake. 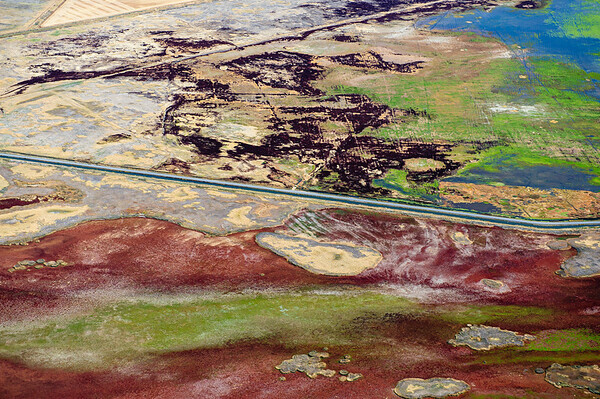 A large shallow freshwater lake in South central Oregon, with bordering colorful dry lake beds which look pretty boring from the ground but are very spectacular from the air. 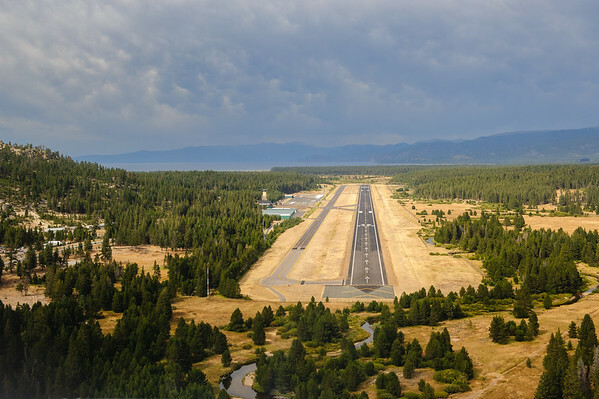 We stopped for fuel at a small airport called Fall River Mills and then continued along the Sierra Nevada to the South Lake Tahoe airport (6300ft elevation). Lake Tahoe is after Crater Lake, the second deepest freshwater lake in the US and is a major tourist attraction for both California and Nevada. It is also home to a number of nice ski resorts and is a great place to live! We stayed the night in the eco-friendly 968 park hotel. 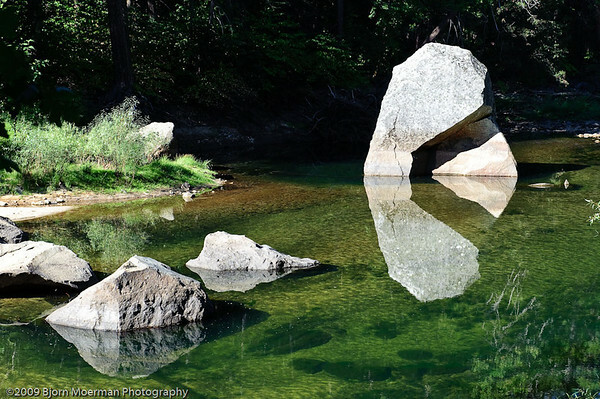 A perfect place to start your Tahoe adventures. After a nice 2 night break in Seattle it was time to move on! 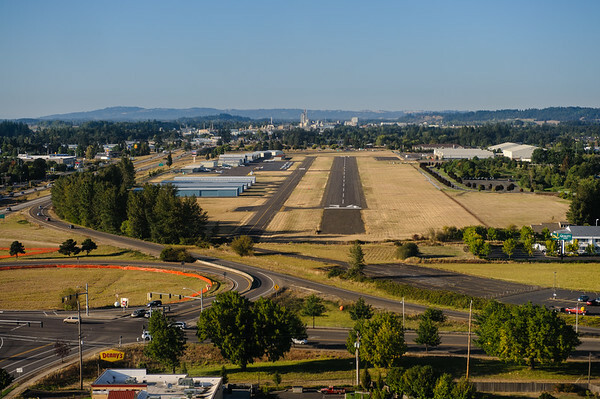 Taking off from Seattle's Boeing Field, we headed Southeast bound to our first close Volcano encounter. 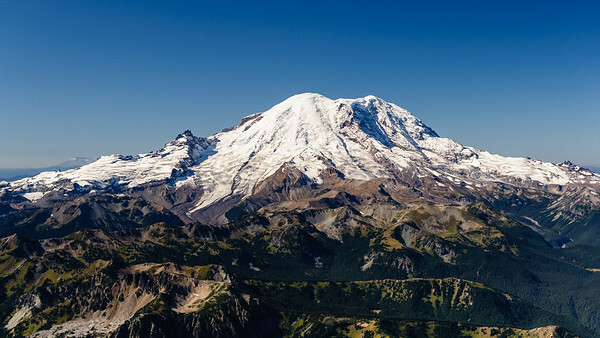 The first one on the list was the +14000 ft (4392m) snowcapped Mount Rainier. 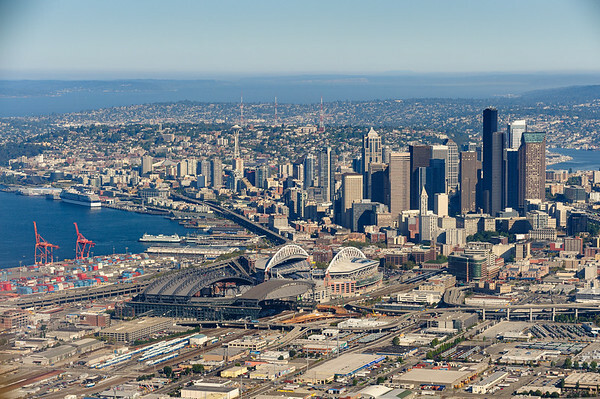 Even though almost 90km away, it dominates the SE horizon in downtown Seattle. Just half a hour later, we had a great view Mount St Helen, which erupted in 1980 and until today is the deadliest (57 people died) and economically most destructive volcanic event in the history of the USA. One can clearly see the blown off cone, which reduced the pre-eruption elevation of 9677ft (2950m) to the current 8365ft (2550m). Meanwhile we passed Mount Adams, 12281ft (3743m) on the right hand side. The second highest Washington state volcano after Mt Rainier. 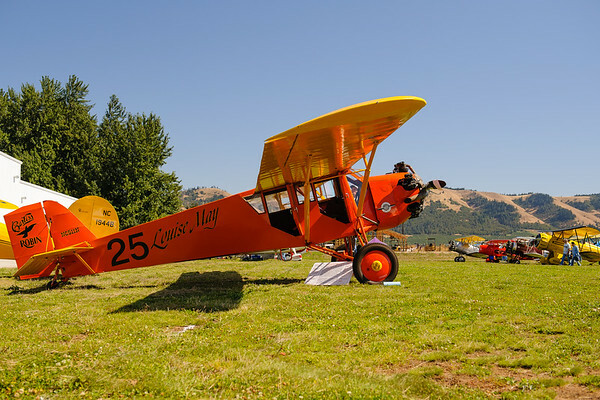 Our first landing of the day was at Hood River airport, along the famous Columbia river Gorge where we attended the first day of the annual WAAAM Antique aircraft Fly-in. The WAAAM (Western Antique Aircraft and Automobile Museum) houses +60 old timer aircraft and over 100 vintage cars, tractors and motorcycles. A great collection for anybody to have look at when traveling in the Portland area. Even though Friday was the first day of the event, there was already a steady flow of inbound visiting aircraft. 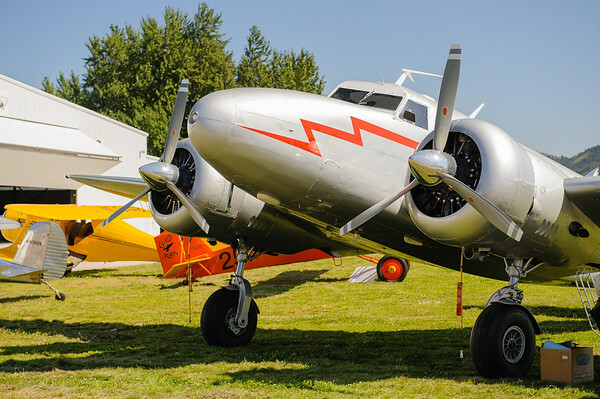 From a very rare Curtiss Robin J-1 to this beautiful 1937 Lockheed 12A Electra Junior. A small aviation paradise! 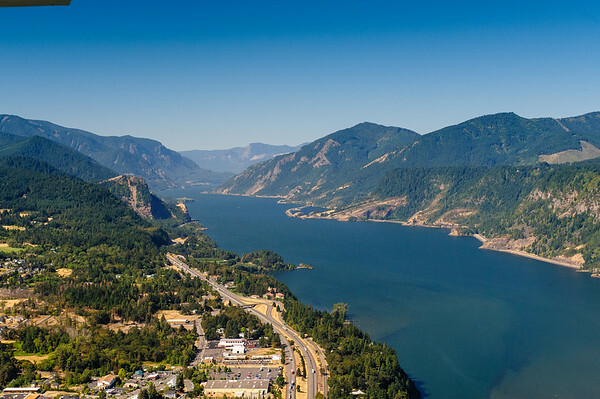 We flew through the Columbia Gorge with its +30kts winds until approaching Portland and then headed to Mc Minville, the homebase of the Evergreen Aviation and Space museum. This museum has the original Howard Hughes Spruce Goose, the worlds largest aircraft by wingspan that only did 1 brief flight in 1947. Due to time constraints we didn't enter the museum but will surely do so whenever we're in the area again. Looking for a convenient airport for the night we stopped at Albany (Oregon), where the Quality Inn hotel has its own aircraft parking right outside the hotel. Bottom right hand side of the photo above. After an excellent night sleep in the B&B "The Craftsman" in Pacific City we moved on. 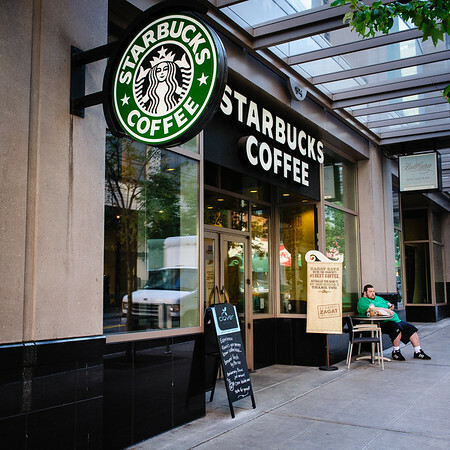 The final destination for the day was the city of Boeing and Starbucks Coffee, Seattle, Washington. Checking the online aviation weather reports after breakfast, it looked like we would have to do without the sun for most of the day. After a short hop along the Pacific ocean, we landed at Tillamook (KTMK). 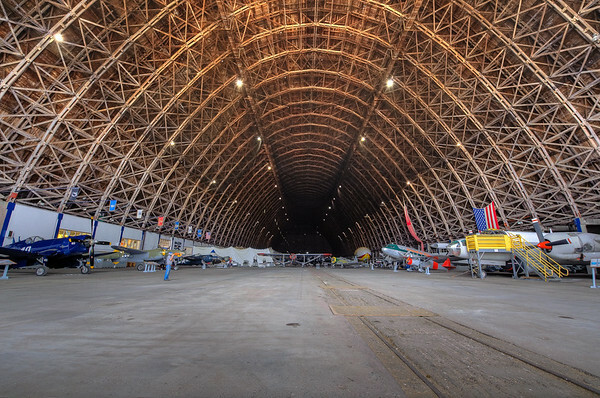 We were told it is the largest wooden structure on Earth and even only the building is surely worth a stop if you're in the neighborhood. After a brief weather check, it looked like the weather was worsening along the coastline while the inland Portland area was clear. We decided to scud run across the mountains to the East and made a safe landing at Chehalis-Centralia airport between Portland and Seattle. On the last leg to Seattle we were sailing through clear air again and touched down at the very busy Seattle Boeing Field runway 18 left. We stayed at the art hotel, Hotel Max, for 2 nights and were pleasantly surprised by what the capital of the Pacific Northwest had to offer. Blue skies and perfect late summer temperatures made the experience even better. Who told us it always rains in Seattle? Early morning of day 2, we left Gold Beach along the spectacular Oregon coastline. 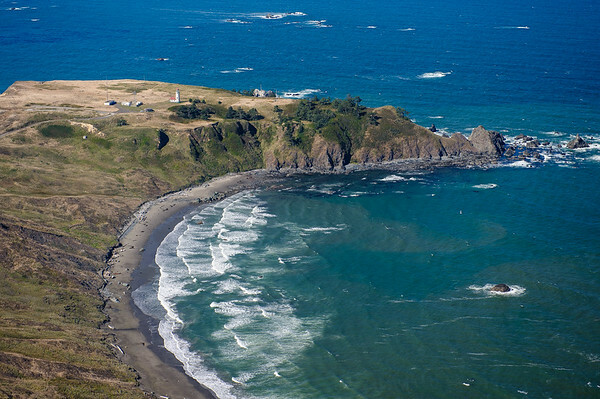 The first landing of the day was at Cape Blanco, the most Western point of the state. Circling the Cape, we had a great look at the Lighthouse, built in 1870... Guess that's old in American standards! ;). Once again we were clearly lucky with the Oregon weather. 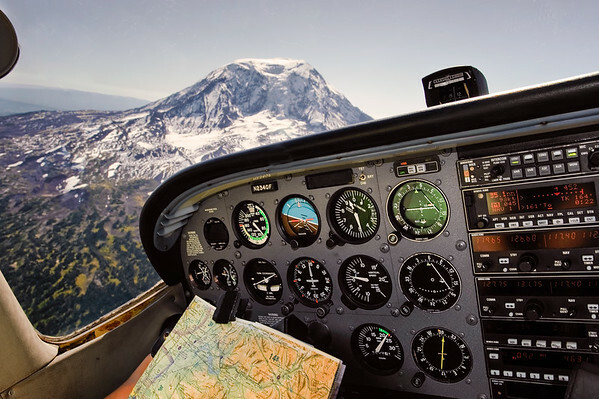 Having checked the weather reports for airports like Arcata,North Bend and Newport a few weeks in advance on a daily basis, we were excited to cruise along blue skies for our second day. 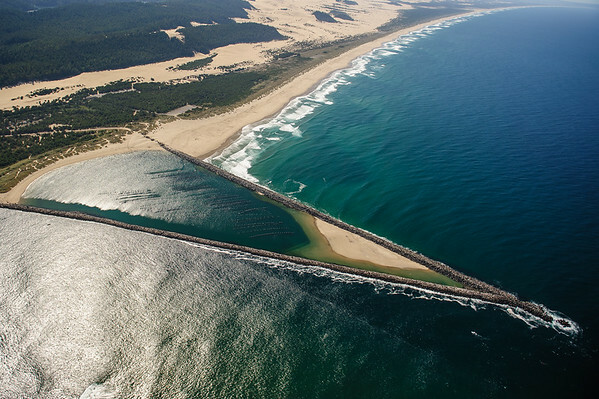 At Umpqua, 30km (16nm) North of North Bend, we overflew this interesting triangle shaped Oyster bed. The lunch stop for the day was Florence (OR), an airport ran by a friendly couple who suggested to grab the free FBO car to the nicely restored Old Town of Florence. We elected to take 20 min walk instead and really enjoyed one of the most beautiful and charming towns of Oregon coast cities. 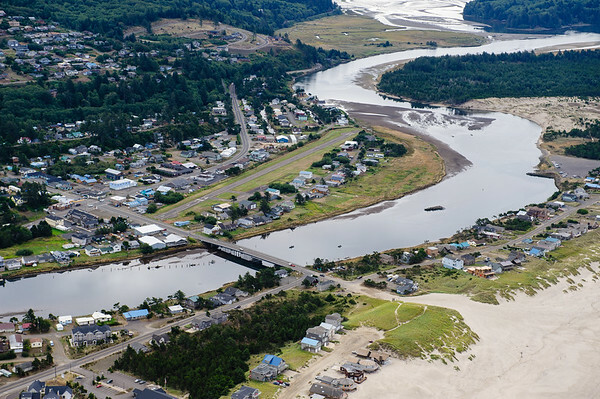 Located on the waterfront, it is a perfect place to explore art galleries, antiques stores, gift shops and finish up with a nice lunch next to the Siuslaw river. 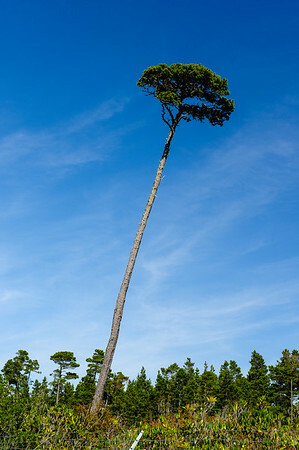 This crooked tree, proves that Florence can be windy at times. Just North of Florence the scenery changes quite drastically with about 40 NM amazing sand dunes instead of spectacular rock formations. Our favorite landing spot on the +3000 km trip was the destination for the night, Pacific City (KPFC). 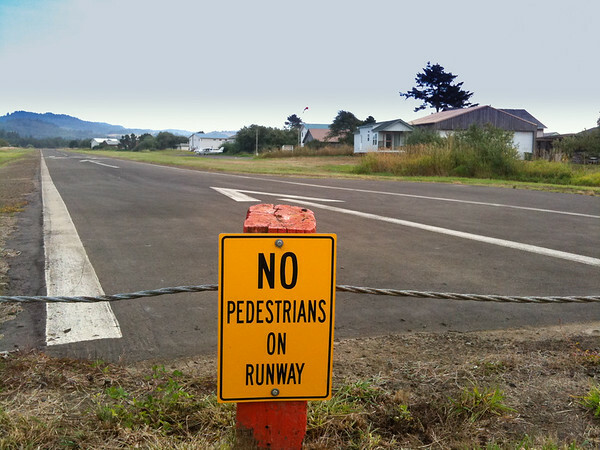 The runway just over 500m (1800ft) long and a tiny 9m(30ft) wide, brings one right in the middle of the little coast town. We stayed at the excellent Craftsman B&B, just across the runway. Mike was very hospitable and I can strongly recommend The Craftsman to all flying and non-flying people visiting this Oregon jewel.